If you’ve spent any time at the farmer’s markets in and around Atlanta, you’ve now doubt noticed the stands for Pine Street Market. 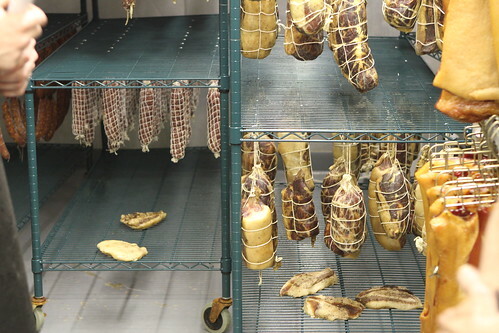 Opened in 2009, Pine Street Market offers a wide variety of fresh and cured meats not to mention jams, biscotti, pickles, and pilaf. 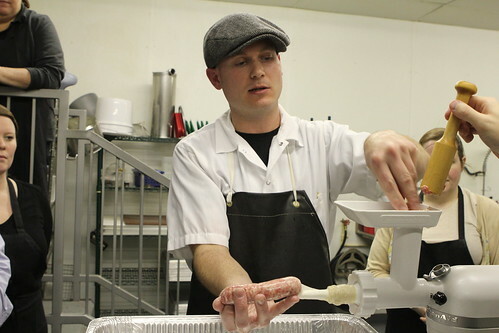 Well Pine Street recently teamed up with The Cooks Warehouse to host a series of cooking classes about the construction and cooking of sausages. Being ever vigilant, Jennifer pounced on two of the last remaining tickets. 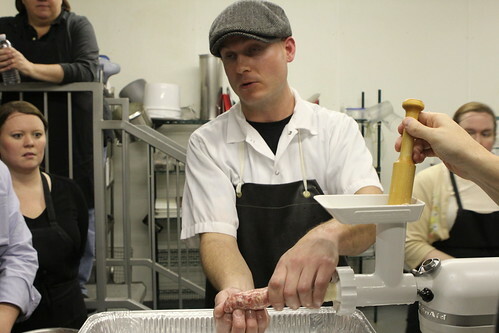 Since she was more interested in the class on cooking sausage, that meant I was able to attend the class on making sausage. 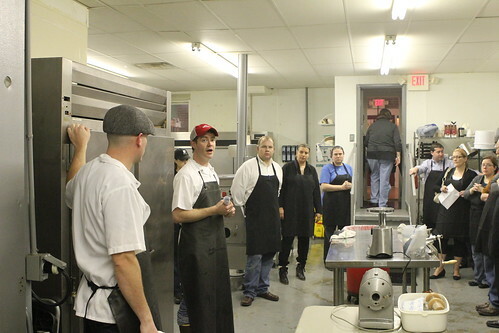 Led by Rusty Bowers, the man behind Pine Street Market, the class included a brief overview of his operation and methods. This is where Rusty and his team get to work. 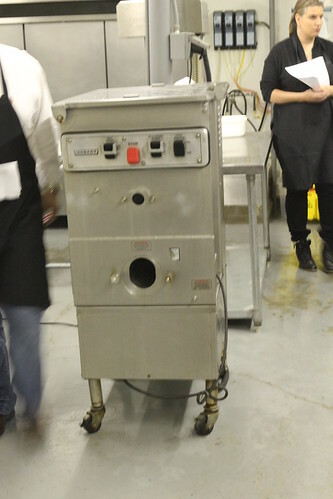 Everything is stainless steel or easily sanitized. 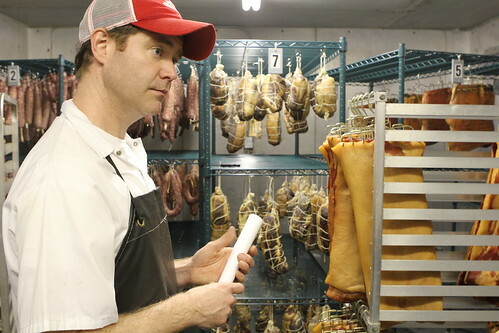 People were dying to know where Pine Street sourced their meat and that eventually led the conversation to bacon. 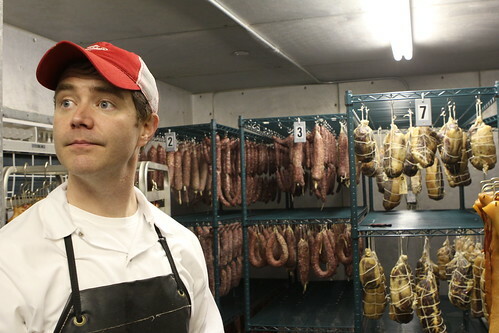 This is a full belly from Gum Creek Farms that needs a few more weeks of curing. 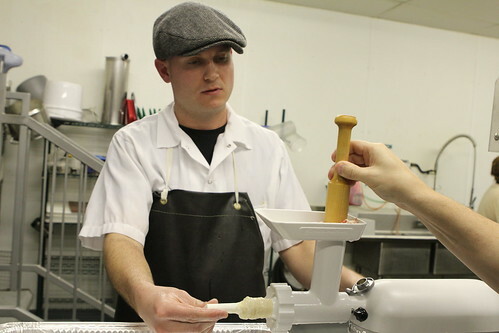 An industrial grade Hobart grinder, I’m not at all jealous of that. The real highlight of the class was seeing Pine Street’s custom made aging room. It’s essentially a walk in fridge that they custom modified. Rusty was more than happy to answer any and all questions. 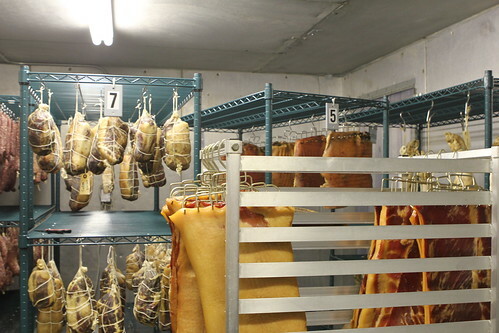 If you look behind the belly, you can see the hoofs of Pine Street’s first batch of prosciutto. After the short tour, Rusty moved on to equipment. 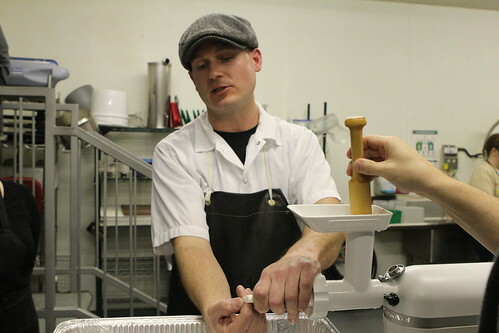 The two ends of the grinding spectrum, a standalone electric grinder and a hand cranked grinder. 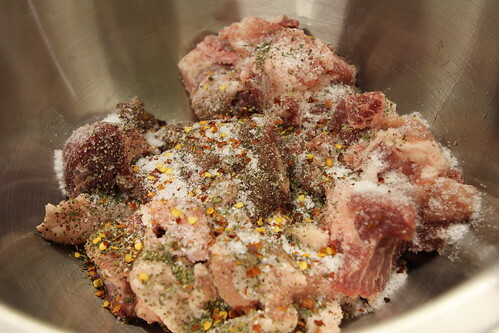 Notice the grinder parts soaking in a container of cleaning solution. It might be a little overkill for home use, but Pine Street is monitored by an FDA agent for two hours each day so they go the extra mile. 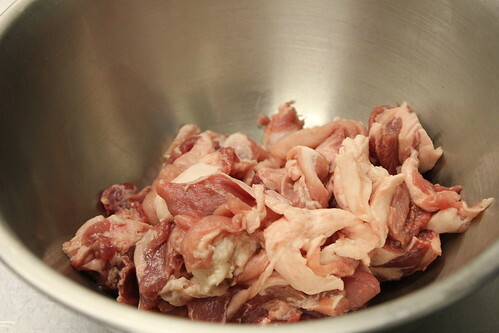 Each student was given a bowl of roughly cubed pork shoulder. 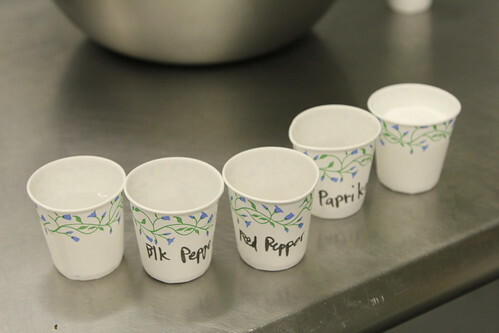 We were then told to pick three seasoning agents, a cup of salt, and a cup of water. I went with black pepper, red pepper, and paprika. 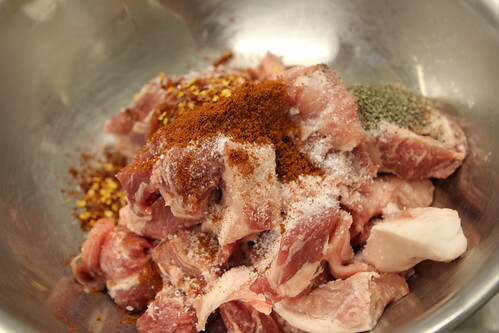 The salt, black pepper, and red pepper were added to the meat. This is setup I used during the class. 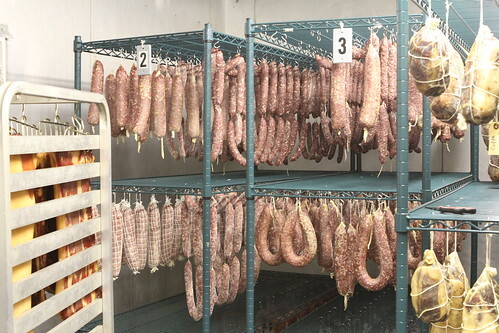 After everyone had ground their meat, each batch was put into the fridge and allowed to rest for a minute while every appliance was cleaned. This gave Rusty the opportunity to discuss the finer points of sausage casings. 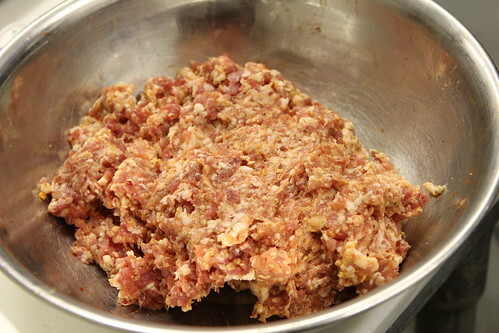 The next step was stuffing the casings with our freshly ground pork. 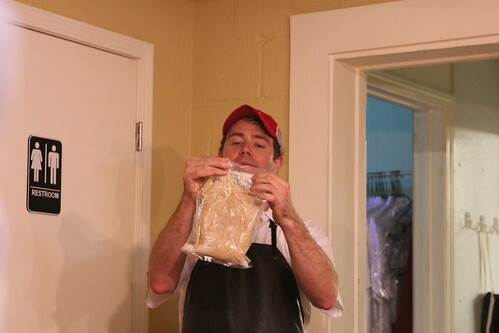 Here, Kyle, the operations manager at Pine Street, shows the class the stuffing process. It’s beginning to take shape. Kyle has years of practice with this process. That’s about one link’s worth. Rusty was conducting the same demonstration on the other side of the shop. 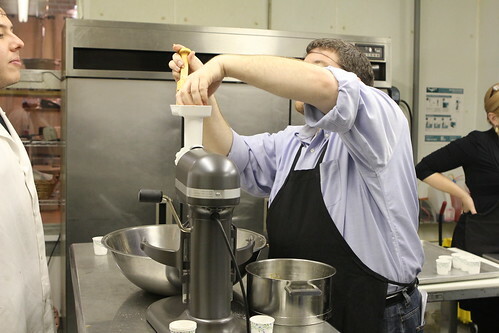 While I was floundering around with the horrible kitchen aid stuffing attachment, Aaron had the right idea by taking advantage of a professional grade stuffer. Overall the class was a great experience. 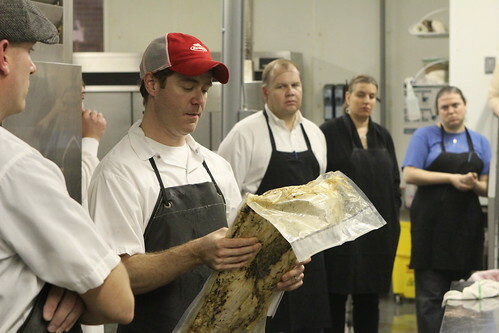 Rusty and the rest of Pine Street Market were affable and excellent instructors. 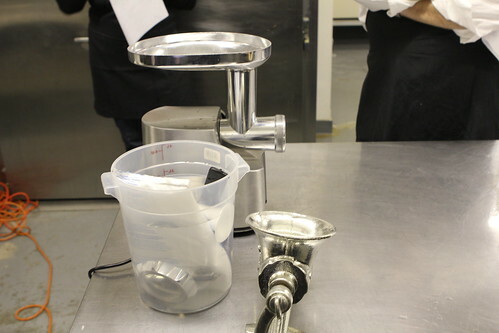 I’ll admit most of the hands-on section of the class wasn’t new to me, but I did walk away with a few valuable lessons. First was the correct speed when using the Kitchen Aid mixer and the second was to never buy the stuffer attachment for that mixer. 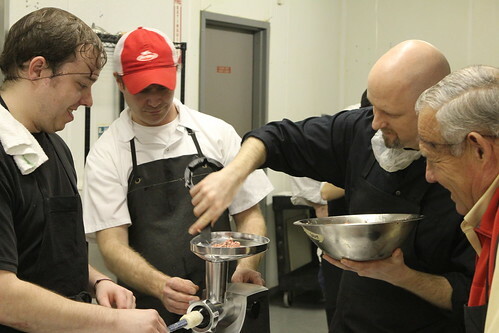 Despite my instructor’s best efforts, I had nothing but frustration from air bubbles and tears in casings. I really should have followed Aaron’s lead and gone for the industrial solution, but I suppose I’ll save that for the next sausage class.